Karnataka proudly boasts of rapid industrial development, scenic natural beauty, wildlife presence, exquisite beaches, pilgrimage destinations, and renowned shopping malls succinctly juxtaposed on the same topography. Karnataka is replete with geographical diversity as well, and parts of it can be split into the Western Ghats, Coastal Karavali regions, and the Deccan Plains. Hospitable natives, lip-smacking cuisine, pleasant weather, and well-laid transport system makes Karnataka a regularly frequented tourist destination. Once the royal capital of the grandiose Vijayanagara Empire; Hampi today is a magnificent conglomerate of more than 500 monumental ruins that proudly articulates the essence of its bygone majestic history and religious significance. As the home of Lord Shiva’s bride Pampa, Hampi is regularly flocked by devotees of Shiva, and the annual festival ‘Hampi Utsav’ gives a glimpse of the vibrancy and splendor that hasn’t diminished in the past so many years. Hampi is the mecca for architectural enthusiasts who crave to explore the renowned Hindu style of architecture with some traces of Mughal impression mixed prodigiously. Classified as one of UNESCO’s World Heritage Sites, Hampi is being restored by Archaeological Survey of India (ASI). Things to see and do : Sacred Center, Royal Center and Bouldering. When to go : December through February. 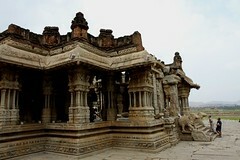 Plan to spend at least 3 days in Hampi. Scooters are available for rent. Those are a fun way to explore Hampi. Along the banks of the Malaprabha river, lies the city renowned for its conglomerate of beautiful temples. Often attracting tourists who either want to revel in the piety of the temples or observe and explore the architectural majesty of the bygone years. Huchimalli temple, Durga temple, Raval Phadi cave temple all bear a significance of its own, however the most renowned is the Lad Khan temple that is bordered by two huge mantapa or gateways in the front. Around 10 km from Aihole lies another sleepy temple city, Pattadakal. The group of ten temples is the main attraction of the city, the striking feature of which being the interesting architectural contradiction between the Nagara and the Dravidian style the temples have been built in. 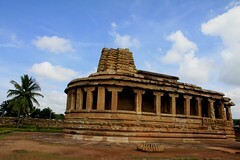 A beautiful heritage site brimming with picturesque natural beauty, both Aihole and Pattadakkal are great cities to visit to escape from the din of the metropolitans. Things to see and do : Aihole & Pattadakkal temple complexes. When to go : September through February. Make sure that you hire a qualified guide. Both these places have a lot of historical and architectural significance. If you have time, take a short detour and visit Mahakuta temple. As once the capital of the Chalukya dynasty that reigned over Andhra Pradesh for a prolonged period of time, Badami is an excellent source of historical references dating back centuries. 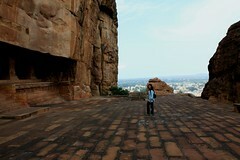 Nestled at the base of a valley, Badami today is exclusively notable for its magnificent cave temples. Considering that the Chalukyas were well renowned for the Dravidian architecture, Badami cave temples are a beautiful blend of north and south style of architecture, labeling it as a popular destination among architectures. Of the four caves, two are dedicated to Lord Vishnu, one to Lord Shiva, and one is considered sacred by Jains. Other places of tourist interest include Dattatreya temple, Malegitti Shivalaya, Bhutanatha temple, and the archaeological museum replete with sculptures and artifacts from various eras. Badami is a good retreat for adventure sports enthusiasts partial towards rock climbing. Things to see and do : Cave Temples, Bhuthnatha Temple and Tipu Sultan’s Fort. Head to the cave temples early in the morning to avoid the crowds. Watch out for the monkeys on the way to the fort. They can get very aggressive. Founded by the Chalukya dynasty, Bijapur was formerly known as Vijayapura. Later, after its acquisition by Adil Shah, the now historically enriched city was renamed Bijapur. Although a prominent Hindu abode, Bijapur is one of the few places in India, the populace of which is of both Aryan and Dravidian descent. A beautiful city pregnant with a rich cultural legacy and embedded with traces of both Hindu and Muslim style of architecture, Bijapur houses some of the most renowned tourist spots in India- such as Gol Gumbaz, a magnificiently colossal dome, Malik-e-Maidan, known to be the largest medieval canon in the world, and Ibrahim Rauza, which is any architect’s dream come to true. If you want to revel in the beauty so prominently synonymous with ancient India, Bijapur should be a must-visit on your travel itinerary. 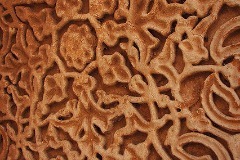 Things to see and do : Gol Gumbaz, Jama Masjid, Ibrahim Rouza, Bara Kaman, Malik-e-Maidan and Gagan Mahal. 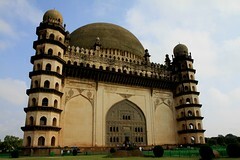 Start your day with Gol Gumbaz since it can get very busy later during the day. Sample a serving of Shenga Holige, a flat bread filled with jaggery and peanuts. Having earned the sobriquet of the ‘crown of Karnataka’, Bidar is a beautiful city of ruins. With an assortment of historical monuments and modern-day tourist hubs, Bidar gets a small but significant strength of tourists every year. Promising a salubrious climate throughout the year, Bidar is distinctly known for the famous Bidri handicraft. Formerly known as Mohammadabad, Bidar bears a very stong influence of Islamic culture, and the Mahmud Gawan Arabic University is a crucial establishment both from an educational point of view and as a place of tourist interest. The Bidar Fort is another popular tourist attraction exemplifying the rich Bahmani architecture. The famous Darga of Syed Shah Burhanuddin is especially cherished by people of all faiths, while Manik Prabhu Temple is another attraction owing to its architectural and religious relevance. Things to see and do : Bidar Fort, Barid Shahi tombs, Darga of Syed Shah Burhanuddin, Jami Masjid, , Chaubara, and Khanaquah Hazrat Nur Samnam. When to go : October through January. You can request the officials at the musuem (fort) to let you into Rangeen Mahal. Explore the market area for authentic Bidri handicrafts. Along the banks of the Yagachi river lays the serene city of Belur, which was once chosen to be the capital by the Hoysalas. Legend has it that the dauntless leader Sala had once killed a lion that was about to pounce on Guru Sudatta Munni while he sat in meditation. In turn, the guru blessed him and gave the reigns of the city to Sala, who was later given the sobriquet Hoy, meaning strike. The Chennakesava temple complex apart from exemplifying the sacredness associated with temples is also replete with stunning Vijayanagara architectural style. Halebid or the city of ruins as it is literally translated to mean, houses a good number of Hoysala temples. Apart from being an abode of piety, Halebid is a befitting conjunction of India’s historical and cultural legacy. Basadi Halli, Shantaleswara temple, Hoysaleswara temple, and Kedareswara temple are all monumental in terms of both religious and architectural significance. 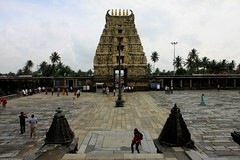 Belur – Chenna Kesava Temple. 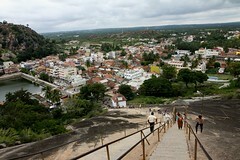 Halebid – Hoysaleswara Temple, Shantaleswara Temple, Kedareswara Temple, and Basadi Hill. Although this can be done as a day trip from either Bangalore or Mysore, it is better to stay one night in the region and explore Belur, Halebid and Sravanabelagola. There aren’t a lot of restaurant options in the region. Carry some food with you. Deemed sacred owing to the presence of the world’s tallest monolithic statue of Lord Gomateswara- the Bahubali statue and also due to its religious significance as an important Jain pilgrimage destination, Sravanabelagola is mostly frequented by devotees. Another major attraction is the once-in-twelve-years festive celebration of Maha Mastakaabhisheka that attracts tourists from all over the world. The sheer vibrancy laced with a religious tint makes this festival one worth waiting for. The last Maha Mastakaabhisheka was held in the year 2006, and is essentially centered on bathing the colossal Bahubali statue with pots of milk, sandal, and saffron paste. Also noted is the Chandragupta Basadi, another Jain temple dedicated to Chandragupta Maurya, and the Chandragiri Hills that is home to hundreds of monks. Things to see and do : Gomatesvara, Vindhyagiri & Chandgiri hills. If you have time, do check out the nearby Jain Bastis. The lush dense forest that houses various species of the big cat family, Nagarhole National Park or Rajiv Gandhi National Park is one of India’s most well-maintained wildlife reserves. Promising diverse wildlife presence in the form of tigers, leopards, bonnets, macaques, four-horned antelopes, civet, sloth bears, gaurs, barking deer, as well as an abundance and eclectic habitation of various species of birds, Nagarhole National Park is a must-visit for every wildlife enthusiast. In fact, anyone looking for a surreal taste of Nature would relish the unadulterated expanse of soft valleys, crystal-clear streams, and stunning waterfalls. Things to see and do : Jeep safaris into the national park. When to go : All year round. Avoid the Canter/Bus Safaris. They tend to quite noisy and uncomfortable. Opt for Jeep Safaris instead. Go for both morning and evening safaris. 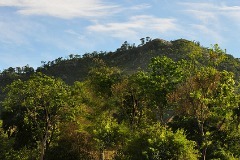 Take a reprieve from the humdrums of daily life and get close to nature at Bandipur. The wildlife center as a part of the Nilgiris boasts of some of the rare species, and was also the chosen site for Project Tiger- an Indian Government’s initiative to protect the endangered species. Apart from tigers, Bandipur is home to elephant, mouse deer, sloth bear, pea fowl, four-horned antelopes, pythons, panthers, hornbills, giant squirrels, and Partridges. Aside from the blatant wildlife presence, one can also witness various exotic species of trees such as Sandalwood, Bamboo, Honne, Teak, and Mathi. 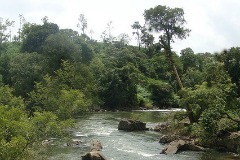 The reserve is irrigated by Moyar, Kabinu, and Nugu rivers. 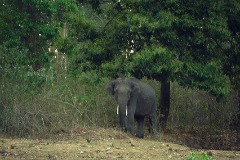 Bandipur is a haven for anyone looking to capture nature and wildlife at its utmost. When to go : April through January. Not all resorts have permits for jeep safaris. Bear this in mind while making stay reservations. The intellectual capital of Karnataka, Mysore has earned the sobriquet of the City of Palaces owing to the conspicuous presence of palaces built by architects of the Wodeyar dynasty. Mysore is synonymous with the vivacious festival of Dusshera, characterized by burning down a life-size replica of Raavan, the nemesis of Hindu God Ram. The festivity lasts for 10 days, and on the 9th day a special ceremony is conducted to worship the imperial sword. Mysore is almost a modern day paradox, the city has held on to its rich heritage while having developed leaps and bounds in the past four decades. Definitely a place worth visiting if you are a devoted Ashtanga yoga practitioner or an enthusiast since Mysore happens to be the progenitor of this Yoga form. 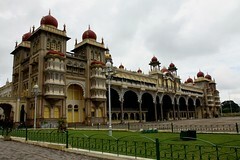 Things to see and do : Mysore Palace, Jaganmohan Palace, St. Philomena’s Cathedral, Rail Museum and Dussehra. Mysore is the place to be during Dussehra festival. The Rail Musuem is highly recommend for train enthusiasts. The ‘Kashmir of the South’ Coorg is a breathtaking hill station replete with picturesque natural beauty and pleasantly cool climate. The widespread beseeching greenery in sharp contrast with the clear blue of the sky and water makes Coorg one of the most-visited hill stations of the country, especially during the scorching summer months. Coorg is an excellent trekking destination due to the abundance of adventurous trails that go deep into the hills. The lush green forests are a reprieve from the lack of greenery synonymous with metropolitan cities, and nature enthusiasts specifically visit to get a glimpse of the expansive teak wood forests and coffee plantations. Apart from natural places of interests, tourists can also marvel at the beauty of the Madikeri Fort, Nalknad Palace, Nisargadhama, and Omkareswara temple. The elephant training camp is a major hit with the children. Things to see and do : Trekking, Madikeri Fort, Nalknad Palace, Nisargadhama, and Omkareswara temple. When to go : October through May. If you are traveling with kids, do check out the Elephant Training Camp at Dubare. The region has excellent plantation stay options. The capital city, Bengaluru (formerly Bangalore) is distinguished for being a blend of multi-lingual cultures. As India’s biggest IT hub, Bengaluru attracts a lot of foreign dignitaries of the field. Since the city is replete with greenery, trees lining the sidewalks and gorgeous boulevards, Bengaluru is rightly called the ‘Garden City of India’. Having once been a prominent part of various South Indian kingdoms, the city is marked with historical legacy and traditional references distinct in the shadow of urbanization. Promising a salubrious climate all year round, and an assortment of tourist attractions and an impressive nightlife, Bengaluru is often a must-visit on every tourist’s list. 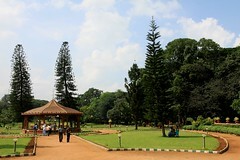 Things to see and do: Bangalore Palace, Tipu Sultan’s Palace, Cubbon Park and Lal Bagh. When to go : March through June. Check out the nightlife while in Bangalore. It is probably one of the best in the country. If you are into live music, do check out Opus.